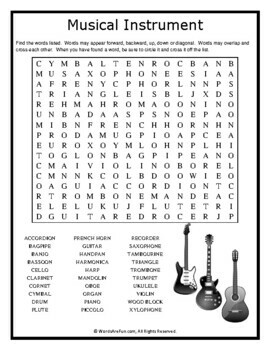 A word search puzzle featuring words associated with musical instruments. This puzzle is tons of musical fun. Use this sheet as part of your teaching curriculum, a treat for early finishers or just for fun. Word List: Accordion, Bagpipe, Banjo, Bassoon, Cello Clarinet, Cornet, Cymbal, Drum, Flute, French Horn, Guitar, Handpan, Harmonica, Harp, Mandolin, Oboe, Organ, Piano, Piccolo, Recorder, Saxophone, Tambourine, Triangle, Trombone, Trumpet, Ukulele, Violin, Wood Block, Xylophone.